“Setting out from Marques de Pompal square, bus 727 winds down old cobblestone streets through Lisbon’s historic Santos District. Flying by pale blue, pink and tan stone buildings decorated with colorful ceramic tiles and wrought iron windows until twenty minutes later it reaches the historic district of Belem. Set along the scenic Tagus River, Belem houses a mix of various styles of architecture, some of the most historic and contemporary buildings in Lisbon can be seen alongside each other. Not sure if Magellan actually frequented the area but Belem is definitely worth checking out! 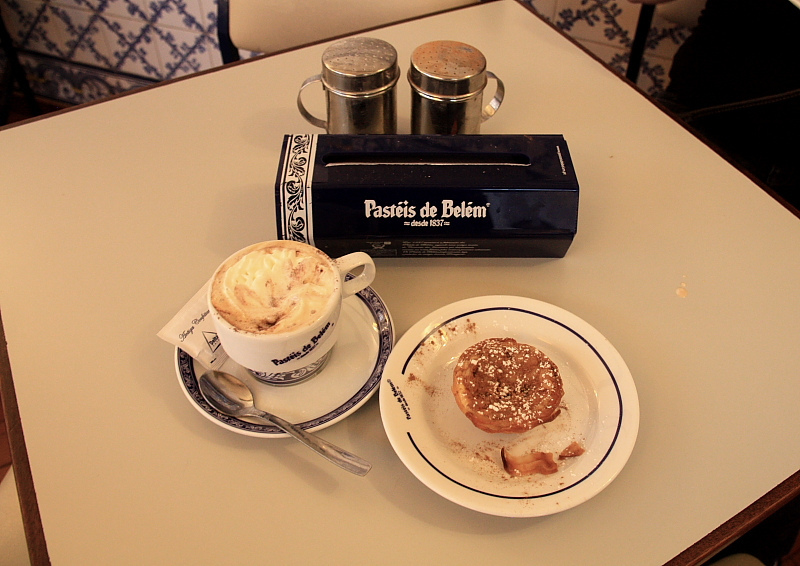 First stop should be to the famous Pasteis de Belem. Opened in 1837, this old world pastry shop dishes out a staggering 10,000 creamy custard tarts a day. This little shop is always packed with locals and tourists, but despite the crowds there is enough seating for patrons and the lines move quickly. Order at least two or three of these traditional pastries with a creamy café con leche (espresso with milk). Before you leave visit the kitchen production viewing area to see trays upon trays of the creamy custards being freshly made on site. Next visit the intricately designed 16th-century building Monasterio de los Jeronimos, here the great discover Vasco da Gama and his crew spent their last night before setting out on his famous voyage to India. The building was actually redesigned from an older monastery but on the same site. The Jeronimos Monastery exemplifies Manueline architecture; a unique style of architecture prevalent in Lisbon during its maritime years. This style of architecture is characterized by intricately carved details coupled with an unusual maritime theme. Portugal was once a great leader in world discovery with many famous explorers setting out from its historic ports. Just across the street is the famous Monument to the Discoveries or “Monumento a los Descubrimientos”. This towering monument built in 1960 was designed to commemorate the 500th anniversary of the death of Prince Henry the Navigator. 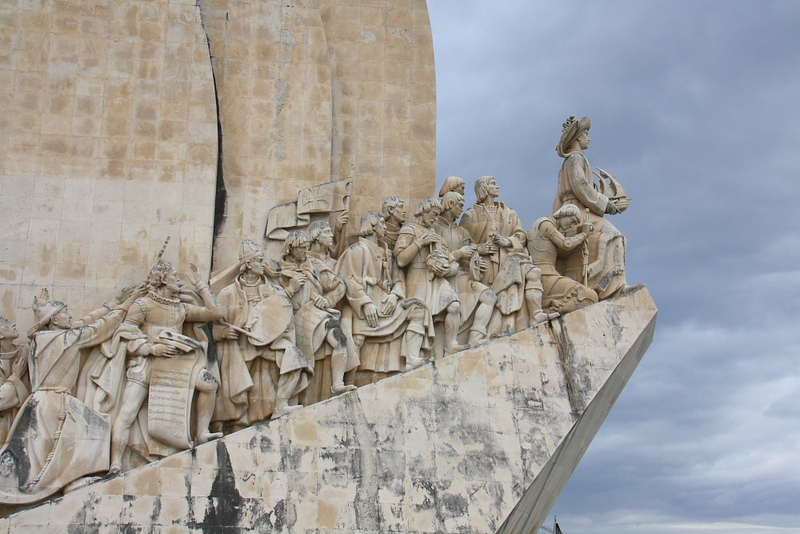 Towering over the Tagus River this intricately carved structure displays many historical figures important in the history of world discovery, including Vasco da Gama, King Manuel, Magellan and many other Portuguese explorers . Located inside is a multimedia presentation outlining the major highlights of the world discovery period of Lisbon’s history. In the distance, a great view of the modern architecture; the 25th of April Bridge as well as the famous statue of Cristo-Rei or Christ with his outstretched arms welcoming seafarers back home to Lisbon’s ports. Further down is the massive limestone Belem Tower. This 16th-century tower was designed by Francisco de Arruda originally as a fortress but over the years it has gone through various stages of usage. It has been used as a political prison, a customs house, and now a tourist destination. This building was made a UNESCO world heritage site because it exemplifies Manueline architecture but with Moorish influences and it represents an important piece of history in terms of the age of world discovery. For such a small area, Belem houses a good number of museums to visit. In particular I enjoyed the Cultural de Belem; one of the biggest cultural centers in Europe. Onsite is the Berardo Museum which showcases an impressive collection of Modern and Contemporary art. The museum typically displays over 225 temporary and permanent exhibits from a number of cutting-edge international and local artists. A visit to this Contemporary Art museum is worth the trip to Belem alone. One of the museums recent exhibitions was from French-born cinematographer and visual artist Pierre Coulibeauf. His installation; “Into the Labyrinth” is a series of photographs and films that sets art into motion. 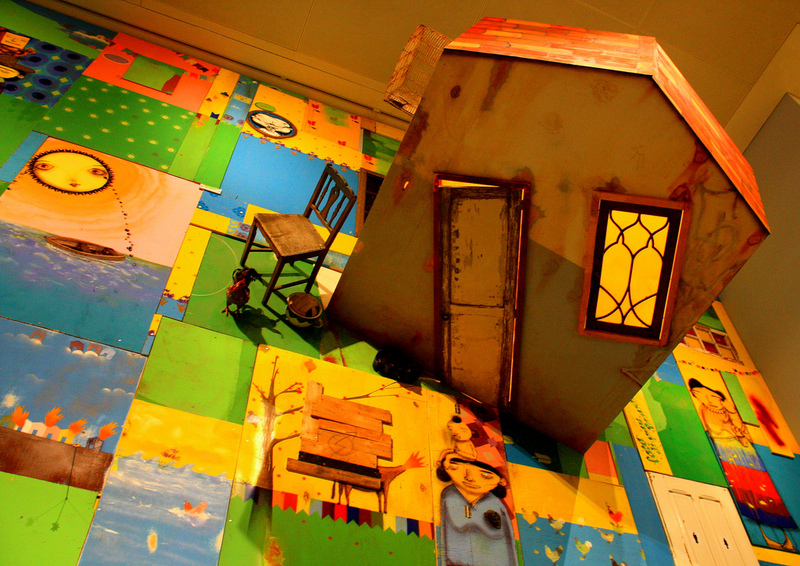 Another visually stunning installation is OSGEMEOS; one name for two Brazilian born twin brothers who have created a fantasy collection of colorful instruments, murals, doors and houses set upon the walls. Children and adults will love this fun colorful interactive installation. The museum has an outdoor cafe offering a panoramic view of both Belem and the Tagus River. To learn more about the leading role Portugal played in world discovery visit the Maritime Museum, this museum houses an extensive collection of permanent and temporary exhibits. Other notable museums within walking distance are the Museum of Archeology, and the Electric museum. After viewing the sites, there are a number of restaurants and cafes to have lunch at before heading back to Lisbon’s city center. For a quick lunch stop at Pão Pão, Queijo Queijo on Rue de Belem for a delicious falafel pita topped with freshly made hummus or try their specialty shawarma plate paired with a pitcher of homemade sangria. At this fast-paced restaurant it’s advised to decide what to order from the menu board posted out in front before stepping into the quickly moving line as both patrons and employees don’t waste time on the indecisive. Although not traditional Portuguese cuisine, Pao Pao attracts a steady stream of locals and tourists with its delicious specialties served at reasonable prices. After a day of discovery in Belem hop on Tram 15 for a fun ride back to the city center. This little portside neighborhood is guaranteed to charm with its panoramic views, maritime monuments, authentic architecture and contemporary flair. This entry was posted in Portugal and tagged an Old World Pastry Shop. lisbon, belem, berardo museum, Pateis de Belem, portugal, tourism europe, travel. Bookmark the permalink.